John is currently a director of and adviser to a number of entities through the company he established in 2005, Growlypaw Limited. John currently is the chair of Moxie Communications Limited, a communications design practice, and Virtual Expos New Zealand Limited, investing in a smartphone application for events, ShowGizmo. He was the chair of the Standards Council from 2010 till wen it was disestablished in early 2016, and for three years during that period he was a Global Board member of Kea New Zealand, which reaches expatriate Kiwis to contribute to New Zealand. In 2007 John was elected as the establishment chair of Aviation NZ for the year it took to develop the capability to support the aviation industry’s export activities, and was a member of the board of the Windsor Engineering Group till his resignation in 2009. 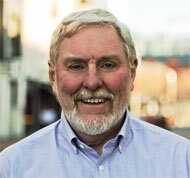 He was deputy chair of the board of Grow Wellington, the region’s economic development agency from 2009 to 2011, was President of the Wellington Regional Chamber of Commerce in 2007 and 2008, and served on the Board of Refugee Services Aotearoa Inc. from 2007 to 2009. John was the first Independent Director of Cuthbert Stewart Limited, an electrical components distributor, serving from 2005 to 2010. Until early 2007 John was Chief Executive of the Meteorological Service of New Zealand Limited (MetService), a position he held since it was established as a State Owned Enterprise in 1992. Under his leadership, a world class meteorological service was established that is now providing services to customers around the globe, one being the BBC. MetService has a record of strong financial performance and is known for its innovative culture. Its subsidiary, Metra, won the 2006 Wellington Region Export Award, and John was a finalist in the 2005 Wellingtonian of the Year Awards. He was elected to the Executive Council of the World Meteorological Organization, a UN Specialised Agency, in 2003 and served until 2007. Before MetService, John’s work experience started with ICI in the UK, then Alcan in Jamaica and Canada, Unilever Canada, and Labatt Breweries of Canada. His particular areas of interest are organisation development, innovation, new product development and marketing, negotiations, services exporting, and now governance and sustainable development. John has a B.Sc. in Applied Science (Mechanical) from St. Andrews University, Scotland, holds a Certificate in Company Direction from the Institute of Directors (IoD) in NZ, is a Fellow of the Royal Society of Meteorology in London and a Member of the Royal Society of New Zealand. A native of Inverness Scotland, now a New Zealand citizen well settled in Wellington, he speaks French fluently, and his interests include aviation (IFR certification ’89 -’95), technology and reading. He is a member of the Wellington Club, and the Wellington Beefsteak and Burgundy Club. Lumsden and Son, Distillers, Wellington is a craft distillery developed with his son Kim, producing single malt whisky, bourbon, and rum, though the products are not for sale.